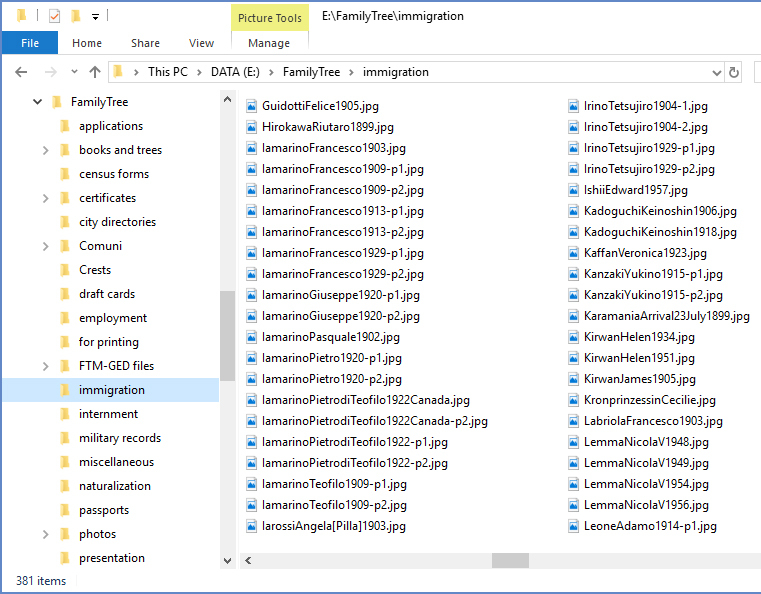 As time passes, you'll find you have more genealogy leads than you can follow. More irons in the fire than you can tend to. It's getting to be overwhelming, right? 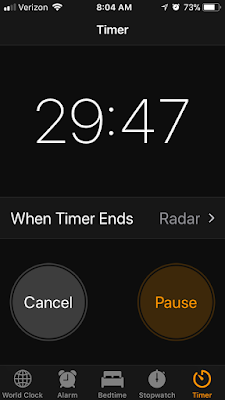 Hold on a sec. 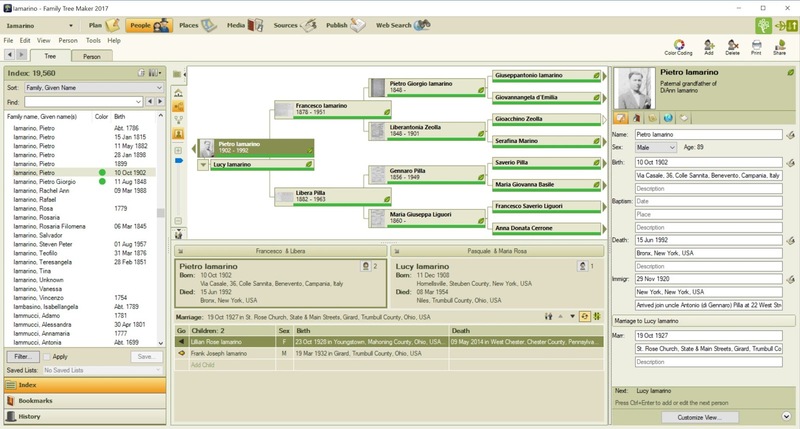 Take a breath and think about why you're researching your family tree. If you expect to reach the finish line one day, take a look around you. Genealogy hobbyists work on their trees for the rest of their lives. Don't let the amount of leads—or the amount of brick walls—stop you from loving this hobby. It's the searching, the leads, and the discoveries that give us the joy. Every step of the process IS the fun. 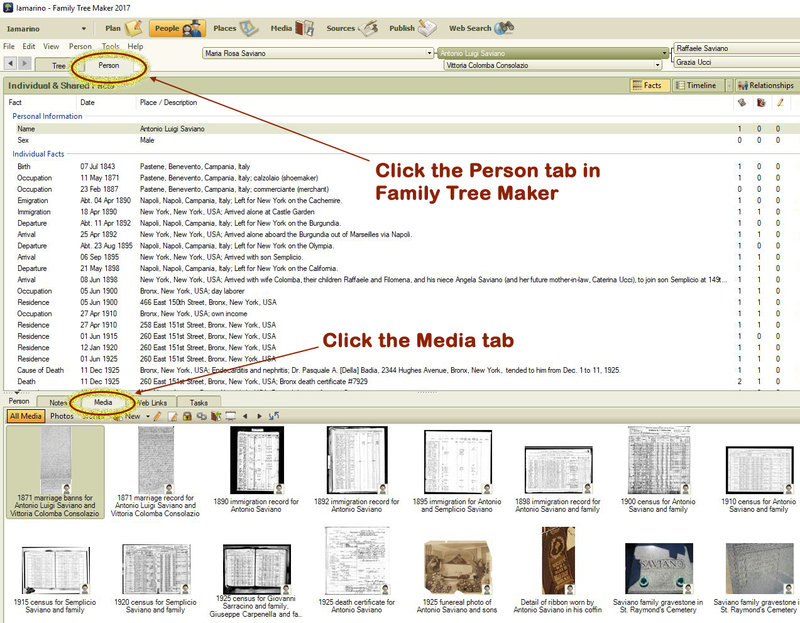 will help you follow genealogy leads. Now that you've got your attitude adjusted, let's get busy managing all those leads. 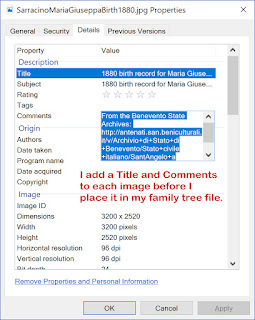 If you've loaded your tree on any public genealogy website, and if you've got your DNA results out there, too. You're going to have people contacting you. People are contacting me in two ways: messaging me on Ancestry.com and emailing me. When I exchange messages on Ancestry, we typically move the conversation to email so we can share files. My emailbox becomes my storehouse of genealogy leads. The key is to organize your email. I have email in my Microsoft Outlook file going back as far as the year 2000. If I might need something again, I put it in a folder. 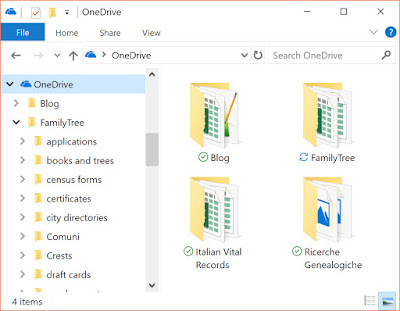 I have a genealogy folder. 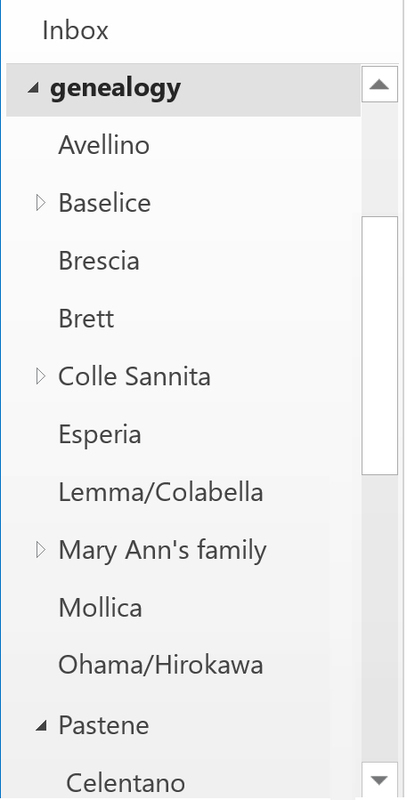 Within that are folders for my ancestral hometowns: Baselice, Colle Sannita, Pastene. Within the town folders are folders for last names from the town. And within those folders are emails from people with a connection to that name. 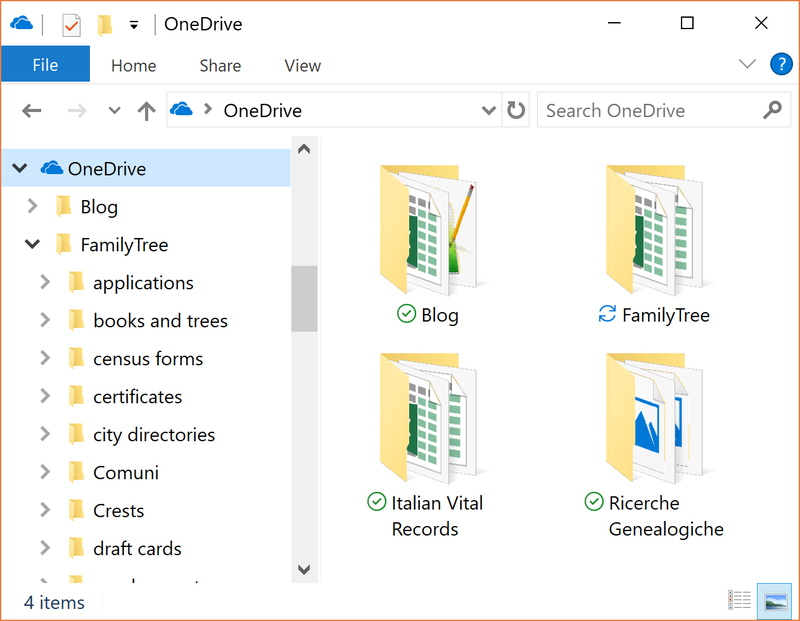 If sorting by town of origin doesn't work for you, sorting by the family name may be better. The important part is, if you've saved your email conversations, you can return to them when you're ready to do the research. 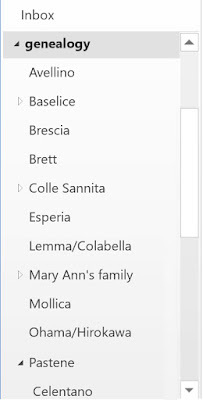 You can search your email at your genealogy folder level and find that conversation from a few years ago. 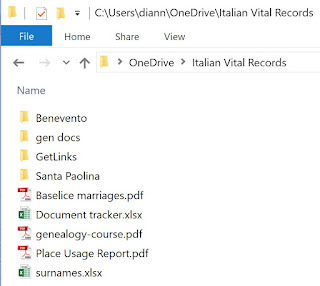 Keep your genealogy leads organized. And keep on keeping them. 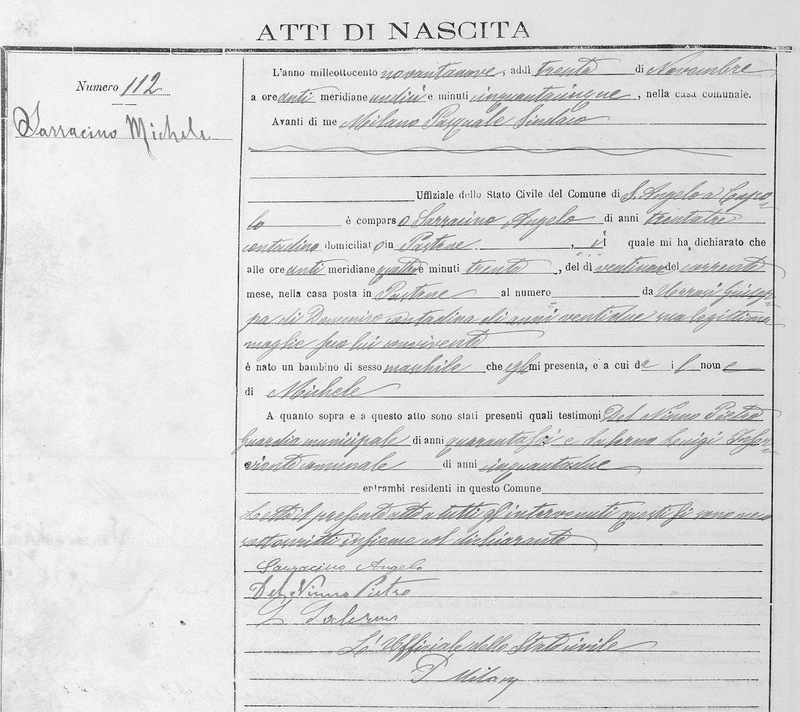 As of this moment, workers are uploading vital records from my "missing" ancestral hometown of Santa Paolina. Hurray!! 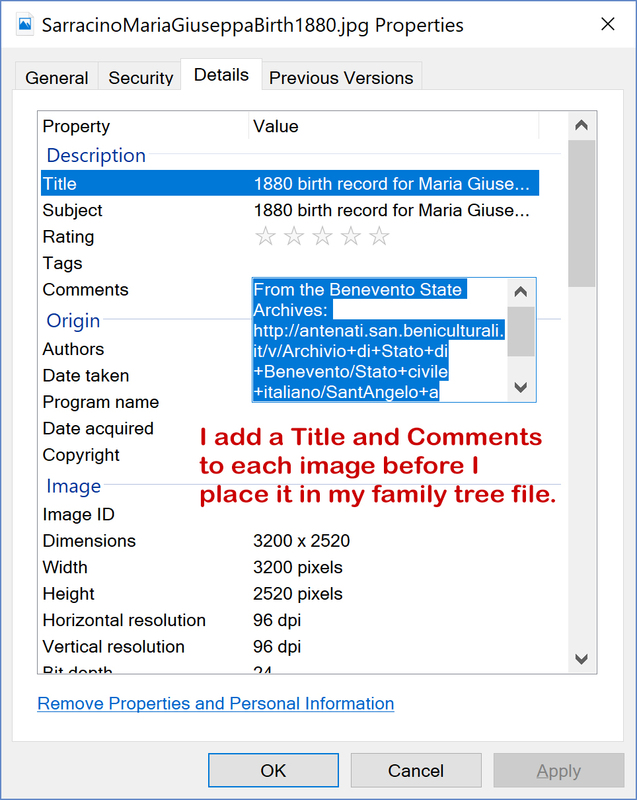 I've already downloaded (find out how you can do this, too) and started processing the records from 1809–1865. I'm eagerly awaiting the post-1865 files. 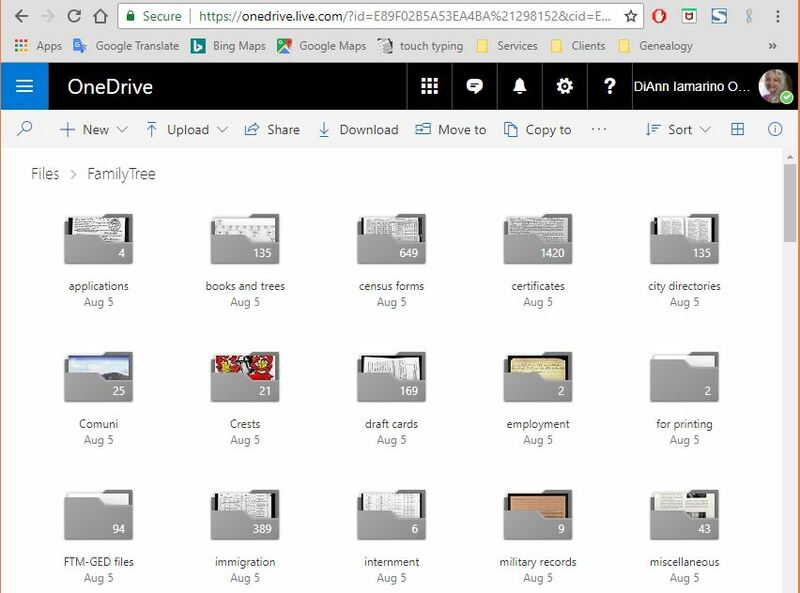 Now that I'm able to document that one branch of my family I couldn't get to before, it's time to go back to my email folders. It's time to reconnect with my leads for that portion of my family tree. And because I'm so ridiculously organized, I can find those leads in a heartbeat. If you're an office worker in the business world, you're used to organizing your email. You need to be able to find what you need when you need it. 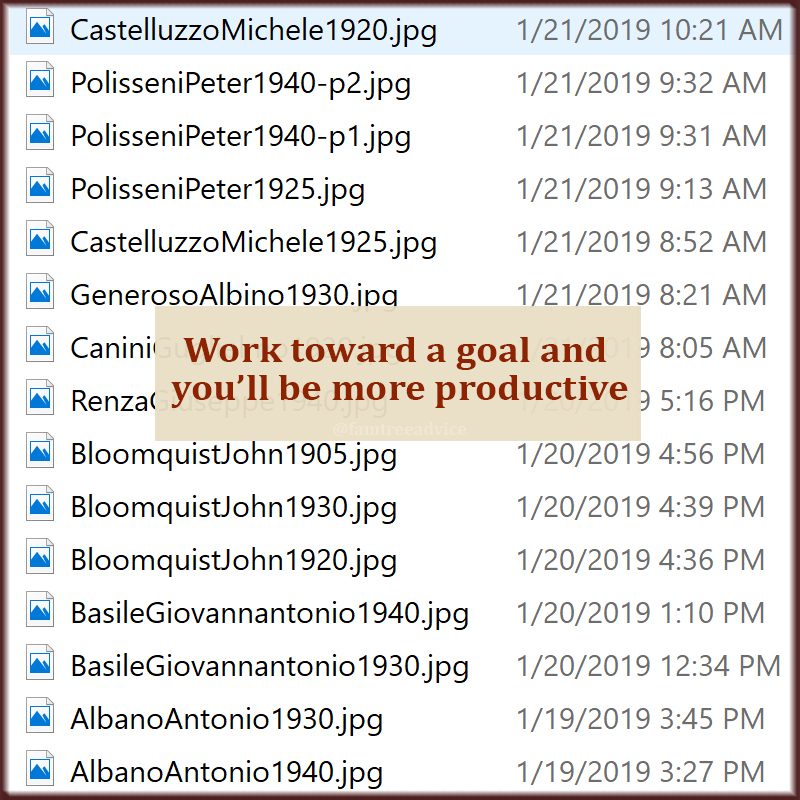 But are you being that efficient with your genealogy email? 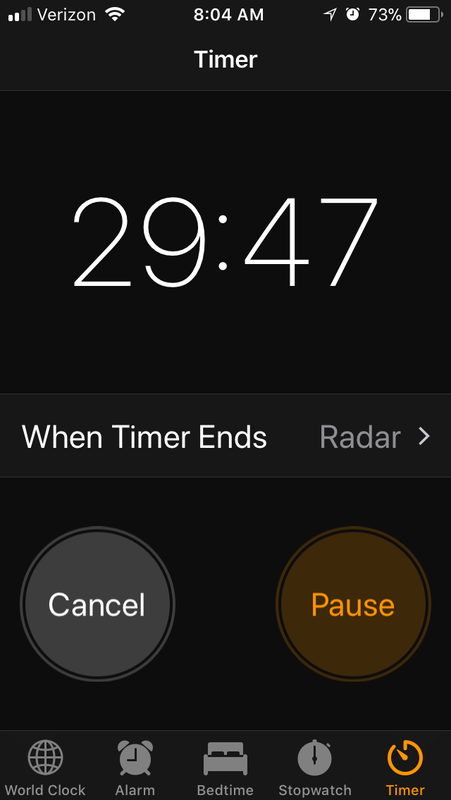 Isn't it time to tame all those messages to make them usable? 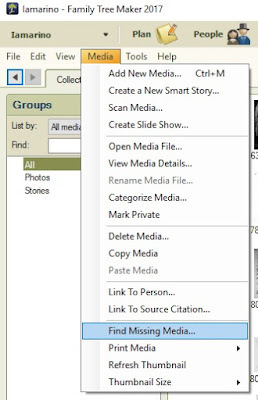 create one text or Word document with all the notes. 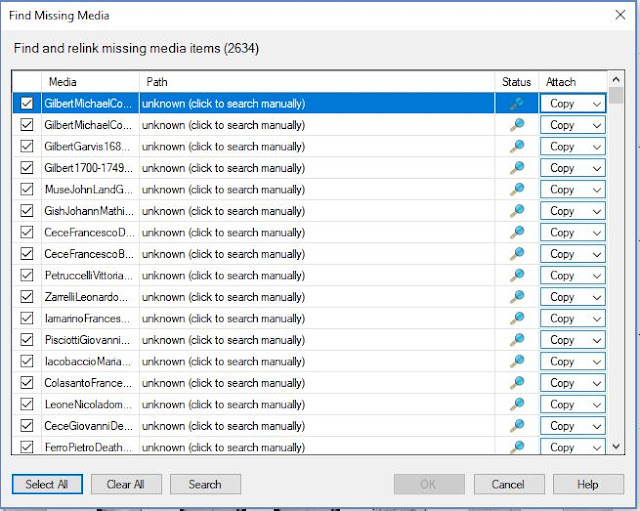 It's easy to search for anything when you've got it typed out and on your computer. Don't let those once-hot leads slip away from you! 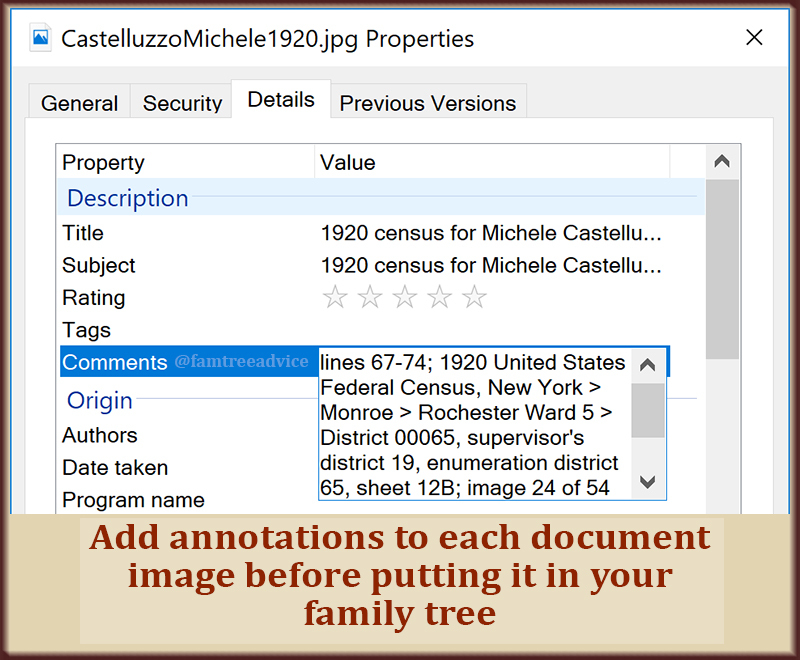 If we amateur genealogists follow some basic rules, our family trees will be so much better. Let's take a look at how you can put these keys to work for you today. If you don't know exactly which town your ancestor was born in, you can't find their birth record. You may not find their marriage record. You might download records from a genealogy site and never know they're for the wrong person. 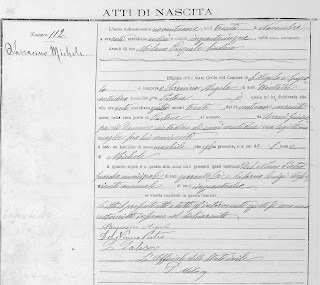 My late step-grandmother's naturalization papers told me her story. Look for evidence of the town of origin right away. It may be on military records, a passport application or naturalization papers. Knowing that town, you can now reject hints pointing to someone from the wrong place. My tree has so many people with the same name. My grandfather had two first cousins. All three of them were named Pietro Iamarino. So before you attach a record to your tree—even if you think it's such a unique name—analyze all the other facts. 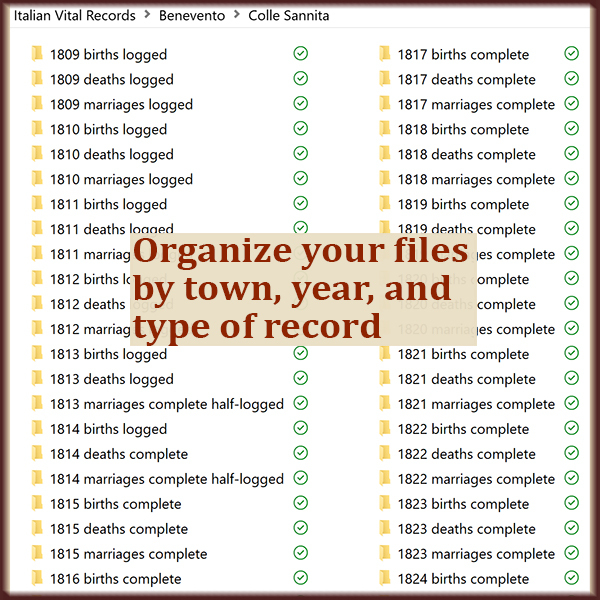 Does everything about this record make sense for your ancestor? Or are there too many facts you know don't match your person? Keep some basic logic in mind. A dead woman can't give birth or get married. A woman can't give birth to two babies a month apart. A man can't become a father more than nine months after he dies. You can add facts to your images. When we begin this genealogy hobby, we're excited by each new name and date we find. And, oh, those ship manifests and census forms! They couldn't make us any happier. It's common to grab those facts and documents and forget about citing your sources. "It's the 1930 census. Isn't that good enough?" No, it isn't. Picture this: One day you realize your uncle lived on the same street as your grandmother. You can't find him in a search. If you could just get back to her census form online, you're sure your uncle would be on the next page. If only you'd recorded some facts and a URL. Put a stake in the ground today. 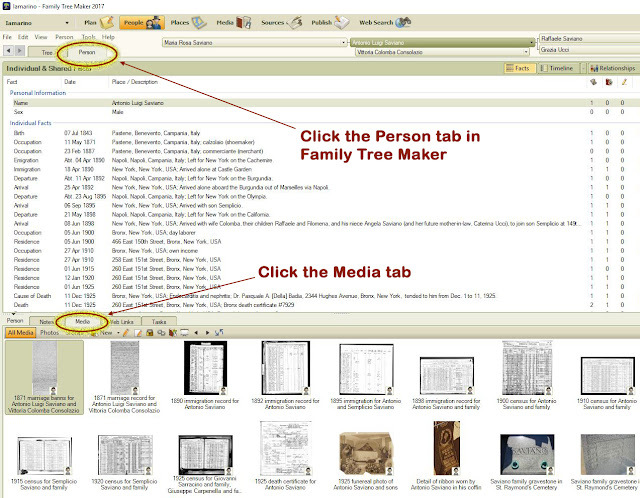 Going forward, you're going to add citation info to each fact and document you add to your family tree. And then spend a few weekends cleaning up your early work. Make that tree better. 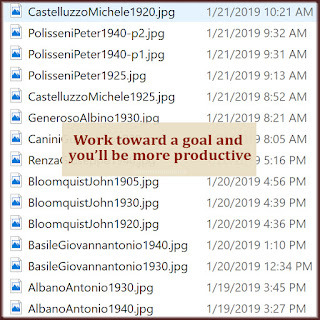 Develop your logical filing system. 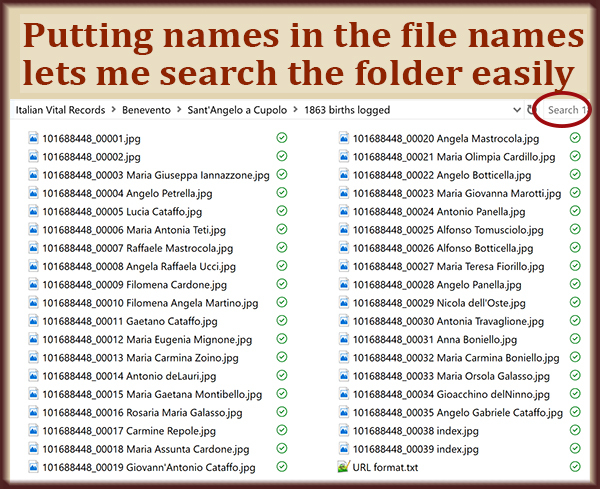 Each file name follows the same format. Generally, it's LastnameFirstnameYear.jpg. Since I keep all vital records in one folder, they are more specific: LastnameFirstnameBirthYear.jpg or LastnameFirstnameDeathYear.jpg. 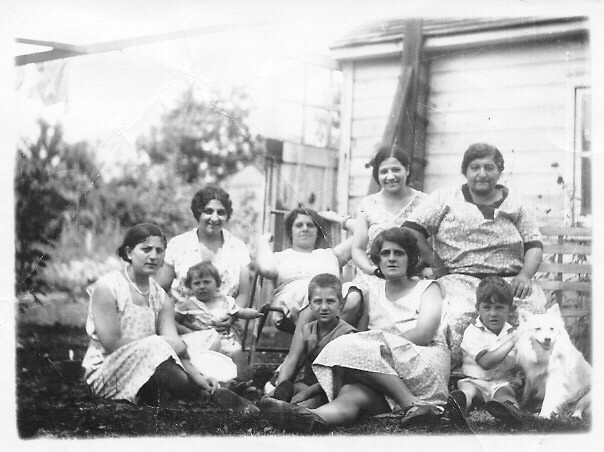 Census records are named for the head of household: LastnameFirstname1930.jpg. This is true of a ship manifest containing a whole family, too: LastnameFirstname1922.jpg. I work with Excel all day long. 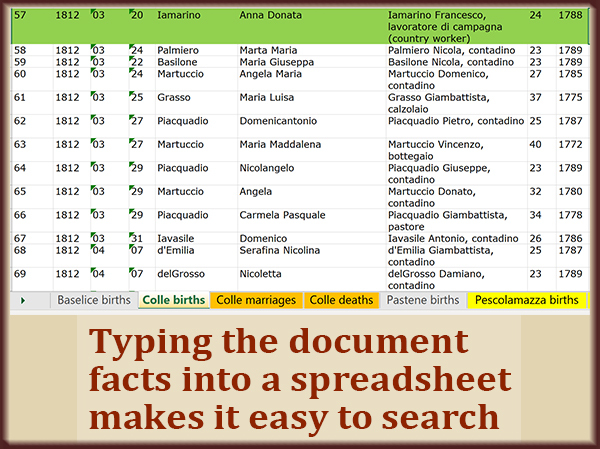 So I catalog my thousands of genealogy records in a single spreadsheet. I store work files on OneDrive so I can access them from another computer. 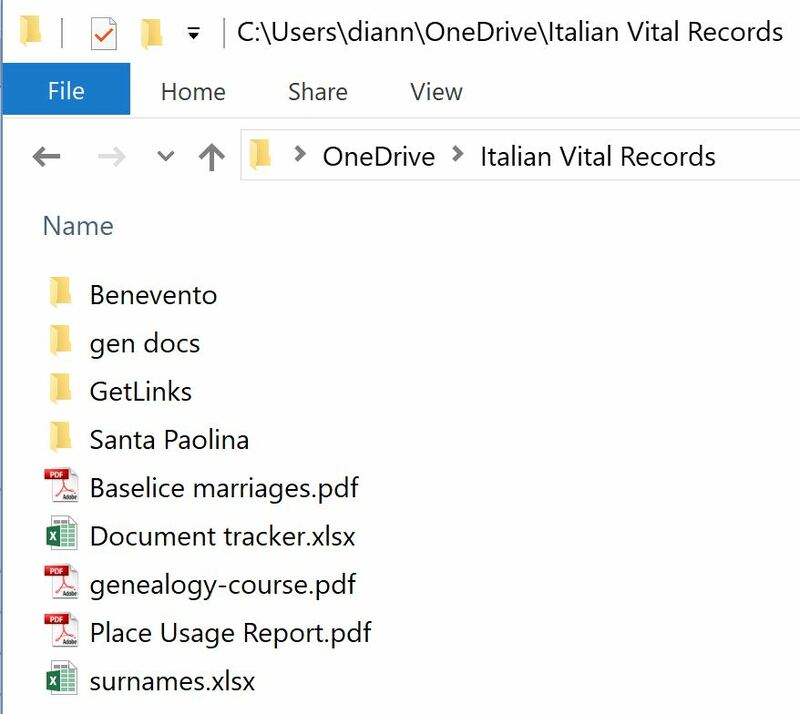 Now I store my tens of thousands of Italian vital records in a OneDrive folder so it's backed up instantly. Be smart, logic and efficient in your hobby. You'll still have all the fun you want, but you'll leave behind a priceless legacy: Your impeccable family tree.